The UN Convention on the Rights of the Child states that every child in the world has the right to play. Unfortunately, that universal right is not always respected. I Like, I Don't Like presents this reality to readers by showing how children in varying circumstances can see the same object very differently. With stark illustrations that perfectly capture the tone of the book, I Like, I Don't Like will inspire meaningful discussions about privilege and poverty. 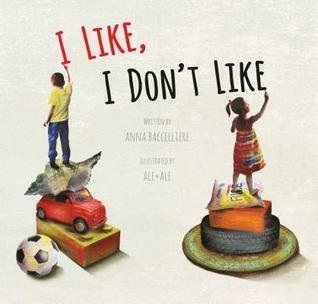 About the Author: Anna Baccelliere published her first children's book in 2004. Since then, she has written numerous books for children and young adults and won several literary awards. She currently lives in Italy, where she teaches lower secondary school and conducts creative writing workshops for adults and children. About the Illustrators: Ale + Ale is the creative team of Italian artists Alessandro Lecis and Alessandra Panzeri, who have been working together since 2000. Although they fantasize about creating collages in a space-ship orbiting earth, they can actually be found at their studio in Paris. To see samples of their artwork, visit www.ale-ale.net. Review: A very simple, but powerful book. Short, easy to read sentences, paired with images that show the stark contrast of life between children who live in poverty and those without that fear. At the end is information on poverty, child rights, and what you can do to help. A definite way to broaden horizons and start the conversation with anyone - regardless of age.